Our En Izakaya dream, has always been to create a modern Melbourne izakaya restaurant experience – a more innovative approach to the taste, texture, aroma & appearance of Japanese cuisine not yet seen in any Melbourne Japanese restaurant. So, what is a traditional Japanese izakaya restaurant? It is a unique Japanese “gastro-pub” – the perfect blend of restaurant and bar. You can think of it as a meeting place – a place to catch up with friends, over the perfect balance of eating, drinking and atmosphere. The whole concept of our Melbourne izakaya restaurant, was to create an establishment that would provide a range of modern Japanese ‘izakaya’ dishes – shareable, and authentic in taste and flavour. I wanted diners to come to En Izakaya and have to think about what they wanted to order, as opposed to knowing what will be on the menu before they even arrive – which is the case at the majority of Japanese restaurants in Melbourne. After considering Melbourne’s inner north-east as a location, we decided on the inner southern suburb of Balaclava, due to its high density living, the eclectic different cultures that formed the community, its proximity to the bayside suburbs & Melbourne’s CBD, plus the fact that the immediate area was well serviced by public transport options. The combination of my passion for Japanese food and culture; my experience living and working for restaurants while living in Tokyo, plus having worked for more than 20 years in restaurants across Melbourne, all gave me the confidence that there was a market for a modern Melbourne izakaya restaurant. And … I was right! When we opened back in 2009, I think there were only 2 Japanese Melbourne izakaya restaurants – now there are about 20. This growth in popularity is not very surprising – the focus on healthy but tasty eating, and the ability to share and taste a number of different Japanese dishes with friends, is a formula that is very attractive for almost everyone. My experience working in Tokyo, Introduced me to the enormous variety and level of freshness & quality which is Japanese cuisine – where the emphasis on seasonal produce was defining. The differences to Japanese food being produced and served in Melbourne Japanese restaurants compared with Japan was a real eye opener. In Japan, because the competition is so high, any restaurant that serves poor quality food just doesn’t survive. The whole concept of izakaya – which were operating all throughout Japan, was particularly interesting, as I had never seen anything like this before in Australia. So what is ‘authentic’ Japanese restaurant cuisine? Japanese cuisine is very simple – definitely not complicated like some western cuisines. 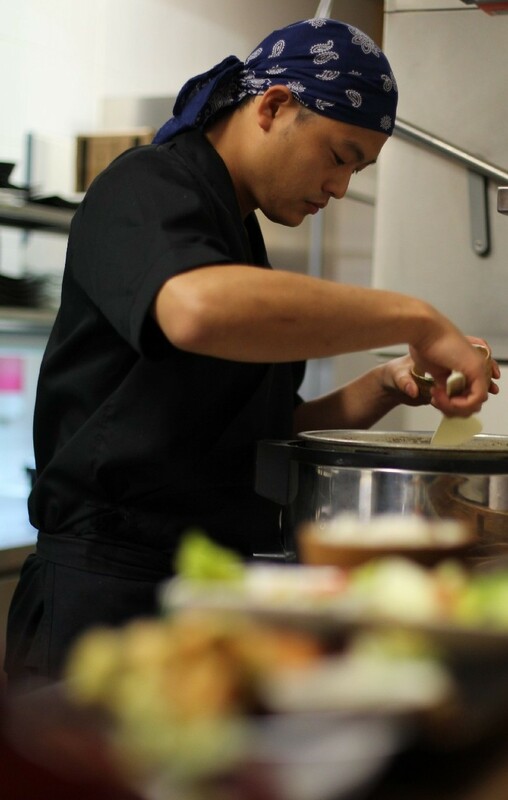 At En Izakaya, we create dishes that have not been deliberately altered for an Australian palate. We aim to showcase tastes that one would experience in Japan. Soy, mirin, and saké are the main ingredients used. Dashi (fish stock) features prominently also. Flavours are subtle – in order to place focus on the taste and texture of the main component of the dish. Our obvious number one priority, when creating an innovative, food focused modern Japanese izakaya – was an innovative, experienced Japanese izakaya chef. And for that, we have family to thank. Hailing from Sendai in Miyagi prefecture, my wife’s cousin, Mr. Teruaki Sato, was a trained Japanese chef – highly experienced with izakaya cooking and menu planning. Travelling from Japan to take the position as Head chef at En Izakaya, we were particularly honoured when Sato joined us, as he had never travelled outside of Japan in his life before! The challenge for Sato was to create a suitable menu using predominantly local produce and I remember that seafood was especially a regular topic of discussion. The range of fresh fish available in Japan is so diverse when compared to what is fished here in Australia. This is particularly evident when comparing a visit to Tokyo’s Tsukij fish market, with the rather limited range of seafood produce available at any Australian seafood market. While Japan is a nation of seafood consumers, in Australia, we are traditionally a country of meat eaters, who have never embraced the local seafood and fish in the same way. Enormous focus was placed on which menu items would be created using ingredients that were available in Australia at a particular time of year. The menu planning process initially took 3 months of trials and testing – sourcing ingredients from a variety of suppliers from all over Melbourne – purchasing samples, ‘tweeking’ recipes etc. The goal was to have a menu where every dish was a standout – not just a handful of ‘hero’ dishes. After four very successful years laying the foundation of the menu, Sato returned to Japan, and Kota Ogawa, who held the role for several years of En Izakaya’s chef de partie, was promoted to the position of our Head Chef. Born and raised in Takayama, Gifu prefecture, Kota Ogawa had previously completed Japanese cuisine training under the supervision of a Japanese chef, together with experience working in a ‘2 chef hat’ venue in Melbourne with a Michelin restaurant trained chef. Ogawa has continued the evolution of En Izakaya’s menu. Initially Sato’s menu offered 20 dishes. Ogawa, over time and using the same principles and philosophies that we have always lived by, has increased the menu to its current 36 offerings. The En Izakaya wine list, features several aromatics from around the globe that have been specifically chosen to match the restaurant’s food offerings. Throughout my hospitality career I have been lucky to have gained much experience working with wine. With En Izakaya, I was never interested in creating an ‘encyclopedic’ wine list – rather, I preferred to offer a more concise list that showcased varietally correct and great tasting wines. This philosophy was also applied to En Izakaya’s list of Japanese sake and shochu. In Australia, these types of alcoholic beverages are still not well known (although slowly growing in popularity), so rather than offer pages and pages of saké, we chose to list a smaller selection of higher graded/quality products. Based on the feedback, we’ve got an almost perfect balance. The En Izakaya atmosphere, is a constantly evolving entity. In its former life, this site was an Italian restaurant and only minimal (and I mean really minimal) renovations were completed prior to the opening of En Izakaya. For the first 6 months we didn’t even have a sign out the front to let new customers know who we were! As we began to grow, the original tiny kitchen was completely overhauled and re modelled to be ergonomically appropriate for our needs and gradual front of house refurbishments took place over a period of almost 3 years. In keeping with our philosophy of complementing the Melbourne izakaya experience, to complete these changes, we enlisted the services of 2 talented and traditional Japanese builders who are brothers from Kyoto (a city famous for its architecture and building structures). Our stunning hand crafted artisan interiors, are now a contemporary version of “kominka”, the Japanese style of wooden housing without nails – the perfect environment for friends, food and drink. As food trends come and go, restaurants need to remain relevant for continual success. So for us at En Izakaya, our outstanding product, delivered with consistently high quality, is the key to your satisfaction and your loyalty. We strive to continually better the delivery of our modern izakaya experience – always subtly refining, always subtly improving. So, come and join us – catch up with friends over the perfect balance of taste, texture, aroma and atmosphere.